Bought two packs of .50/.357 195gr bullets (Duplex). Can't believe how accurate they are. Clover leaf 3/4 inch groups at 100 yards with 100 grains of Blackhorn and CCI 209 primers. Could not be happier with the performance......"
Thank you very much, Terry"
Several years ago while experimenting with a shotgun sabot, I stumbled across the notion of a sabot inside a sabot. The particular sabot I was testing was designed for a .50 caliber bullet to be loaded in a 12 gauge shotgun shell. The problem was that the sabot would stay on the bullet for 50 or 60 yards making the combination very erratic and inaccurate. One day out of sheer frustration, I made a jig and machined the powder skirt off a .45 to .50 MMP sabot. I then inserted this sabot inside the shotgun sabot and with our 300 grain QT .45, I was able to achieve groups of under 1.5" at 100 yards out of my 1100 Remington / Hastings barrel combination. I was sure that this was a fluke so over the next several weeks, I repeated this process every time I tried it. As the process was very labor intensive, I abandoned the project but stored this tidbit of useful information in one of the very small crannies of my brain. The other day, my long awaited .357 to .45 high pressure sabots showed up. Day One I shot my CVA .45 with groups averaging about 1" using 120 grains of Pyrodex RS and 175 grain Dead Center .357 bullet. Day Two was my brand new 1:30" twist Knight Super .45 turn. It did not disappoint and turned in several groups between .625" and .875" with the same bullet and the same charge of powder. My .50 caliber Encore was in my office feeling quite left out of this testing process. 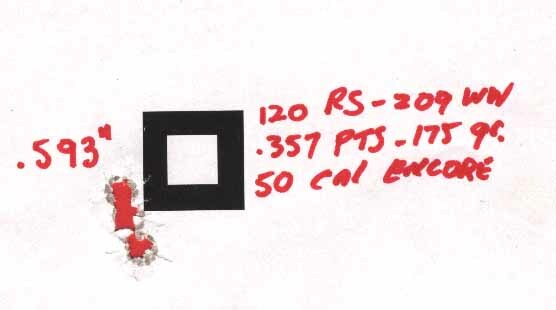 Rather than ending my shooting early, I decided to foul the barrel and see what would happen if I stuck one of the .357 x .45 sabots inside one of the long petal .451 to .50 high pressure MMP sabots. I loaded the same 175 grain Dead Center bullet but only used 100 grains of powder to make sure that everything would cooperate. Immediately after firing the first shot, I walked downrange and recovered the black .451 x .50 sabot 25' off the muzzle. The orange petals of the .357 x .45 sabots were on the ground a few feet further down range. The bullet hole was perfect and very close to where the gun point of impact was on its last use. Realizing that this combination was safe, I decided to increase the powder charge to the same 120 grains of Pyrodex RS that had shot so well in the two .45 caliber test guns. The results were consistent with those experienced with the shotgun slug. My initial group was under 1" at 100 yards. Choosing to believe that this was not something that could be repeated, I continued to shoot until I shot 10 groups in a row that were all outstanding; the best one being .593" and the worst one was still under 1.33". I don't think I would have been very quick to believe it if I had not done it myself. Check this out! Several days after my shooting session, one of my "test hunters" showed up at the shop to admire the new .357 x .45 sabots. I showed him all there was to see and then I laid the notion of "duplex saboting" of bullets on him. He sort of rolled his eyes and questioned my remaining sanity. Within minutes, we had the Encore loaded and out the door and his first group repeated my previous outing. We put up a fresh target and repeated the process with a Knight disc rifle and 120 grains of Pyrodex RS. That was as far as the Duplex Sabot went as there was really no need for them as I already had six .45 caliber muzzleloaders. Two things brought me back to the Duplex Sabot thought process. 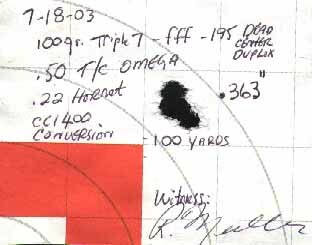 The first was the introduction of the 195 grain .357 Dead Center bullet. All testing to date confirmed that this bullet was the most pleasant shooting, highest ballistic coefficient bullet we had ever made. I decided to shoot this bullet on every hunt until it failed. 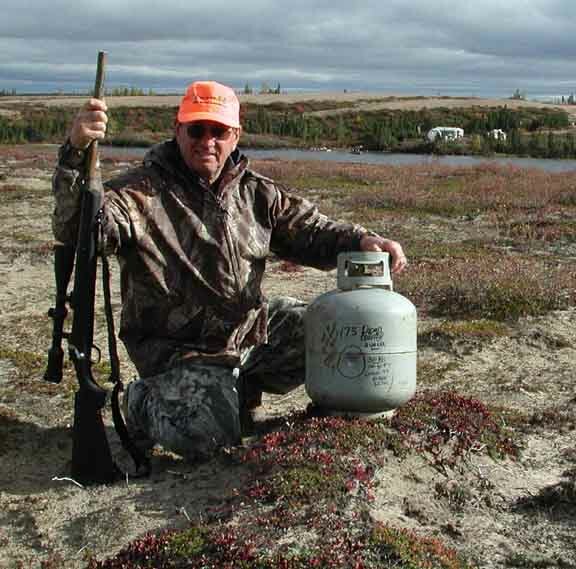 The second was the fact that I had just returned from our annual Caribou hunt and had spent five days lugging nine and ten pound .45 caliber muzzleloaders across the tundra. Walking several hundred yards to your deer stand with a ten pound gun is one thing but slugging across shin deep muskeg twelve miles a day with that same gun is something else. My reasoning was that if I took the plunge and ordered the tooling to have the inner sabot inject molded, I would save at least one pound off my rifle while still getting the great .357 bullet performance. My next call was to Del Ramsey of MMP for the tooling order and to get some kind of time line for the initial run. Del had just received a T/C Omega in .50 caliber that he was planning to use for the fall muzzleloader deer season and he was very intrigued with my Duplex Sabot idea. He had shot the .357 Dead Center in several of his .45 and was very impressed with their performance. Del got my order done sooner than it probably should have and we were off testing and shooting. 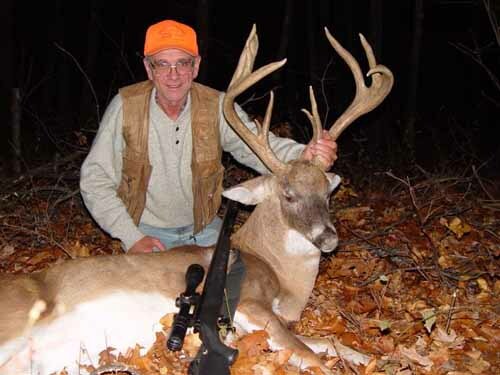 This is Del Ramsey, the inventor of the modern sabot, with his 154" class Whitetail Arkansas buck shot with his .50 caliber T/C Omega using the 175 grain Dead Center .357 DUPLEX SABOT. 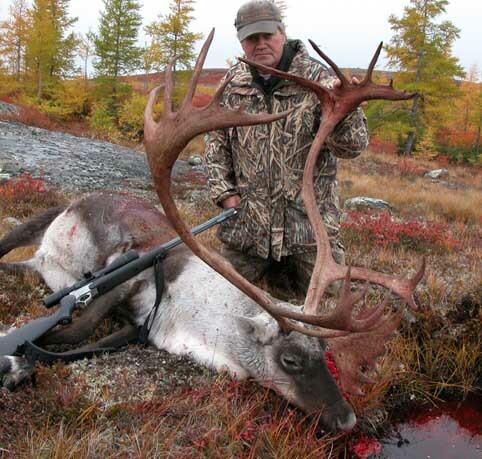 Savage smokeless muzzleloader at 294 yards! .357 Dead Center are available for .50 caliber guns in weights of 175 and 195 grains.